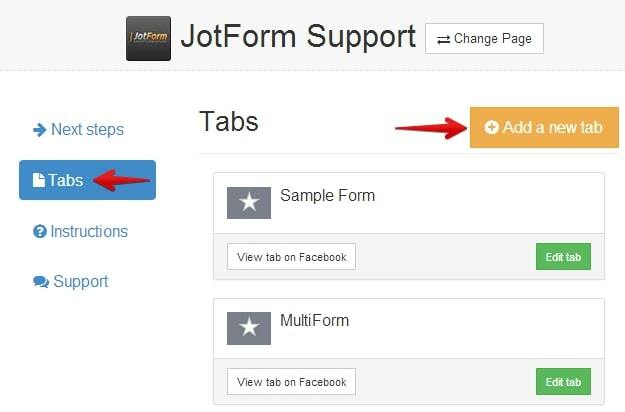 Adding forms to Facebook is quick and easy using JotForm. If you have already created your form in the form builder, follow the instructions below. We use Static HTML: iframe tabs Facebook application on embedding the form to the Facebook page. 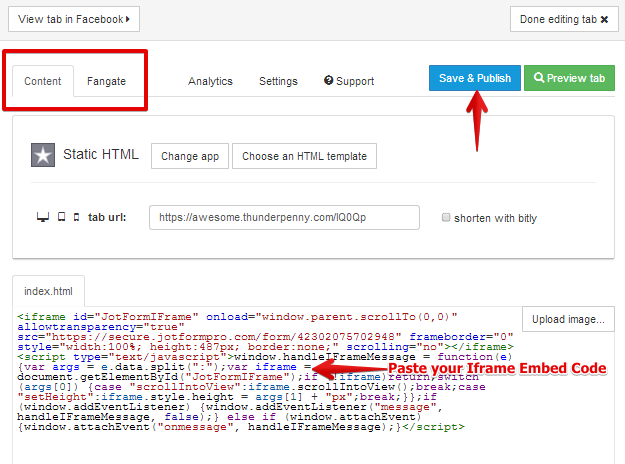 You'll learn how to add this application soon, but let's first get our form iframe embed code for Facebook. You have to use the iframe embed method. Please follow this guide: https://www.jotform.com/help/148-Getting-the-Form-iFrame-Code. 1. 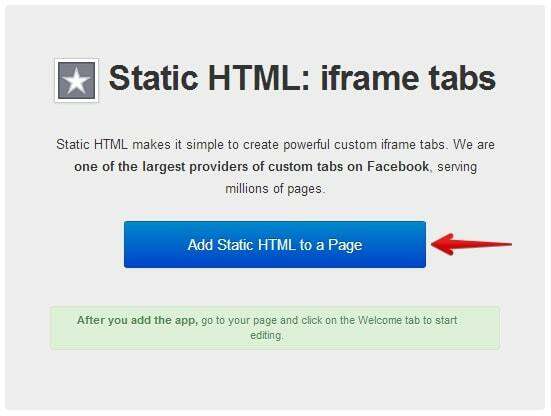 Go to your Facebook page and on the search bar enter "Static HTML: iframe tabs" or visit this link https://apps.facebook.com/static_html_plus. 1. Go to your Facebook page and find the Custom Iframe App you just installed. It is usually found under More options named "Welcome" tab as seen on the screenshot below. See FAQ section below if you want to change the default page tab name. 3. 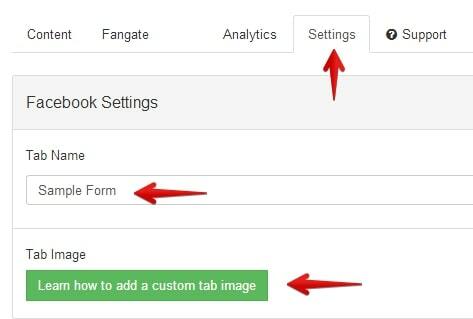 There are two options you can choose to display your form on your Facebook page. The first one (Public Content) makes it available to everyone while the second one (Fan Content) makes it available only to your Facebook fans, or users who liked your Facebook page. Make sure to publish your page afterwards. Check the following screenshot. Adding Another Tab to your Facebook Page (Multiple Tabs). 1. After Saving & Publishing your first tab, click Done Editing Tab button. 2. While on the main page, click Tabs menu on the left and click "Add a new tab" orange button to add another tab to your Facebook page. If the page asks you to login to your Facebook account, please do so, it might need a switch to your main Facebook account before you can add another tab. 1. The page tab does not appear on mobile devices? - Page tab apps are not supported on mobile devices by Facebook's Platform. However, Static Iframe Tab App provides direct URL to your page tab that is viewable on mobile devices. 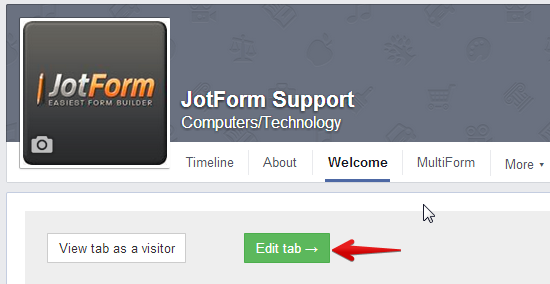 To get your page direct URL, simply edit your Facebook tab and copy the link you see on the Tab URL box. 2. How to change the page tab name and tab image? These can be changed on the tab settings. Go to your tab settings and look for the Facebook Settings section. Under it, you'll see Tab Name and Tab Image. Always use "Secure Form Embed Code" when embedding your form to Facebook. Make sure the form URL found on your form embed code starts with https://. It's highly recommended to use "HTTPS" to avoid any security issues on the page since Facebook requires the secure protocol. If you are stuck with any of the steps above or if you have further questions about this guide, feel free to post it on the comments section below. I want to make an iframe Facebook page plugin. But i am unable to make it. Can you please help me? Hi, I have a Facebook Book page with just 450 followers, and i can't configure static HTML om it, it seems FB changed his policy, they need min 2k followers on page. is there any other way on fb dofollow link. I have embedded the code, now I have two similar tabs with different names doing same functionality also not working for mobile. This page does not have permission to install the custom tab. My page is not yet published, so not sure if that is the issue, or if there is any configuration I need to change to allow the tab to be created. It is working, but i want my viewers on mobile to click on the button on my facebook page. (the sign up button) and fill it on mobile. can you help me on this? 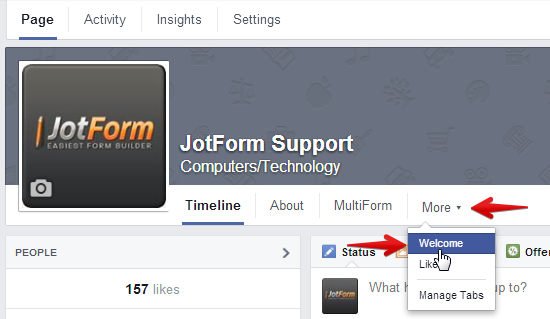 Which method of adding a JotForm to Facebook page is easier to update the form? Static HTML iFrame or the other way? I could nt add the app to my fb page. Please help. I am creating one java survey application and i want to create one facebook app.so can anyone tell me how can i attach my jsp file to facebook apps? Wow awesome and informational site to me, i am also gonna share this site to my friends. Amazing and unique informational site to me, i was also thinking about this great and awesome site. Now that the FB app is added, those who DONT USE FB cannot use my app. I need to take it off, but don't know how... thanks! These are all old, the new one has been changed. So now I don't know how to add my form to Facebook App. the form with facebook integrator brings me no email. Why is that? This is great thank you! Is there a way to make this so that only Fans of your page can see it? Gostaria de Saber se tem como eu pegar o código html e colocar na minha página? how can i create the App on Facebook,we be blocked when click setup new app? I did everything here but when I did the last step it doesn't go straight to the form. Am I missing something ? Le passage en https fait que les applications iframe non configurées https ne s'affichent pas sur les pages entreprises. iframe.apps permet de créer une iframe sans être développeur facebook et évite d'acheter et de configurer le certificat SSL. This is Great!!! It's works on my fans page now. Deprecated: How to create a Facebook Application for your Fit Forms Integration? How to add forms to Facebook? Background color looks different on Facebook?